I present a new perspective for the role DAI has in its relation to Ether. Stability is relative. Something cannot be stable in isolation, it requires an external reference to measure stability against. To humans, the Earth is extremely stable, and there is this big star that spins around us every 24 hours. From an outsiders reference, the Earth is actually zipping around a big central sphere. Which itself turns out to be zooming around a massive galaxy, and so on. DAI is Ethereum’s external reference point. 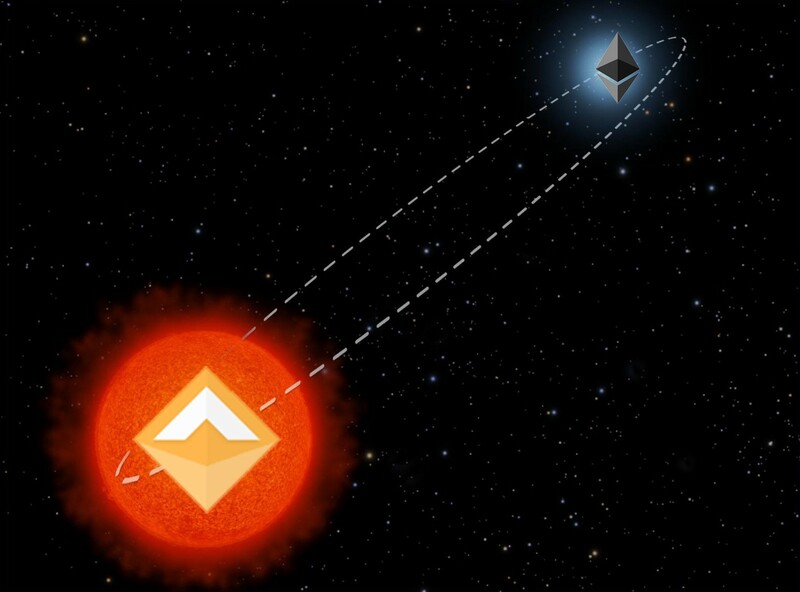 DAI grounds Ethereum to the rest of the universe. It provides context. Wherever Ether goes, DAI is in the same spot. 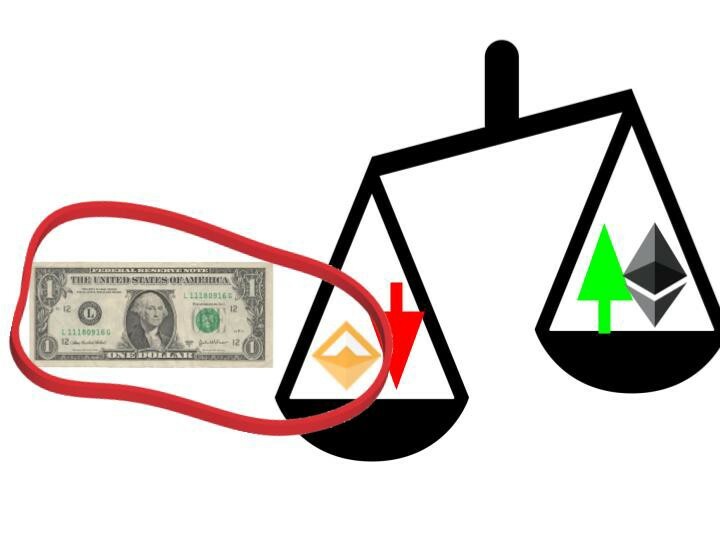 Today, most people view DAI as stable, or unstable, relative to the Dollar. And it definitely is stable to the Dollar, in comparison to Ether. In reference to the Dollar, however, DAI is extremely volatile. Just looking at DAI vs USD, DAI is -5% away from the dollar. In the stock market, you expect 7% YoY. In stock market terms, DAI is 8.5 months away from recouping a negative 5% loss vs the Dollar. Bring Ethereum into the picture. Ethereum moved 5% twice in the last week (I won’t ever need to update that sentence, lol). Inside of DeFi, where DAI dominates and USD is nowhere to be seen, the 5% discrepancy between DAI/USD is effectively invisible, as Ether’s volatility dwarfs DAI’s by orders of magnitude. Say Ether is at $100, DAI is at $0.95, and 1$ = 1$. If Ether doubles to $200, it went from being worth 105 DAI to worth 210 DAI, and from $100 to $200. In both scenarios, Ether is now worth double the original amount of either currency. The amount of relative change is exactly the same, regardless of whether DAI is $1 or not. DAI not equaling $1 has no implications to it’s suitability as a stable reference point to Ethereum. DAI was able to go-to-market with .05% interest rates, as there was initially 0 supply, and therefore only buyers. It also came to market when Ethereum went from $1400 to $80. DAI was in-season, as people fled from ETH to safe havens. For the first year of DAI’s life, DAI was in-demand, and the peg was not an issue. Ether has appreciated for the last 3 straight months. Coincidentally, about as long as MakerDAO has been fighting the $.95–$.98 DAI issue. Owners of DAI have migrated from hoarding DAI, to buying ETH. Consequently, all DAI-holding-Bears turned into Bulls, and market makers had their DAI dumped on them for ETH. DAI has the craziest trick up it’s sleeve. Although DAI pales in comparison in market cap to ETH (92M vs 17B), DAI is able to grab on to an external reference point as an anchor, and leverage the anchors mass. The DAI Peg enables DAI to operate as the center of gravity vs Ether. The DAI Peg harness the gravitational weight of the Dollar, through crypto-economic mechanisms and price oracles. The DAI peg is a soft peg, however. It is allowed to flex, bend and accomodate for market conditions. It’s soft-peg enables a “rubber-band” effect, that keeps DAI vs. USD within certain bounds. Ether’s change in market cap doesn’t impact the valuation of USD in the slightest, but it does change DAI’s. Read Hasu’s article about DAI’s long arbitrage loop that enables/causes this “rubber-band” effect to exist, for more info. DAI reflects Ethereum market forces in ways that USD never could. This is because DAI is it’s own currency. While it’s anchored to $1, it is not $1. It is not redeemable for $1, it’s redeemable for $1 worth of ETH. That discrepancy is the tolerance room that enables DAI to fluctuate it’s value vs USD. Therefore, the shifting balance between buyers and sellers of DAI is reflected by DAI’s valuation vs USD. MakerDAO provides Ethereum the comprehension it needs to understand itself in context to its outside universe. Ethereum doesn’t know $1, it knows 1 DAI. There is no way for Ethereum to comprehend the value of $1 directly. Individual, centralized price oracles can report the ETH price, but the Ethereum blockchain, as a gestaltian unit, doesn’t understand centralized price feeds. A centralized actor can provide a price, but this isn’t a permissionless and decentralized way of measuring ETH price. Ethereum requires data in a very specific form, in order for it to be understood ecosystem-wide: Decentralized / permissionless data. Centralized price oracles do not provide this. Instead, MakerDAO must act like the google-translate for USD-ETH pairs, as reported by various price oracles, for Ethereum to reference it’s value to the Dollar. Ethereum only understands decentralized permissionlessness, and MakerDAO provides the bridge between centralized external reference, and permissionless internal state. DAI is the state-vehicle for Ethereum to comprehend itself, relative to a stable external refernce point. Instead of going from $100 to $200, Ethereum sees itself going from 105 DAI –210 DAI (If DAI is trading at $0.95). This data is shown in platforms like Uniswap, DYDX, UMA Protocol, or any future financial platform that creates a derivative with DAI. These decentralized, permisisonless platforms, that run on a decentralized, permissionless currency, DAI, use DAI’s state as a crucial component of operation. DAI has a value proposition in it’s own right; the internal decentralized, permissionless, stable currency of Ethereum. The fact that 1 DAI is pegged to the Dollar is an afterthought, a means to an end, a necessary evil. It doesn’t matter what the peg is, just that it is there. The only thing that matters is that the peg’s rubber band is reasonably tight to not create poor user-experience based on its flexibility around the peg, but not so tight that the rubberband snaps. Managing the rubberband is the job of MKR token holders. Finding the perfect tautness of the Maker rubberband is MakerDAO governance summarized in a single sentence. So long as the rubberband holds, the price of DAI doesn’t matter outside of it’s relationship to Ether. The view from “inside the blockchain”, or, the data you are able to see in Ethereum’s state, is blind to the outside price of DAI found on Coinbase Pro, or any DAI/USD trading pair. For the functional operation of stable DeFi found in DYDX, Uniswap, or others, the DAI / USD price is completely inconsequential…. so long the rubberband doesn’t break. As the Ethereum economy grows, so does the economy of DAI. The binary star system, as a unit, will grow in magnitude. Multi-Collateral DAI will enable new levels of DAI proliferation, and will also expand the economy of tokenized assets on Ethereum. DAI lockup metrics will appear alongside ETH lockup metrics, and the real indicator will be “Total Value Locked”. DAI will be the main trading pair alongside ETH in Uniswap, DYDX, Augur, DDEX. As all the developers build the Ethereum Money Lego Playset, DAI will continue to get integrated and absorbed by various platforms. As there becomes more reasons to keep your DAI, more and more people will care less about the ETH/USD price, replaced by the ETH/DAI price. When I purchase groceries with DAI, and the grocery store doesn’t sell the DAI for any other currency, we’ll know the DAI/USD price doesn’t matter. For those that play exclusively inside the Ethereum ecosystem, the ETH/USD price doesn’t matter. As the Ethereum ecosystem expands and absorbs further use cases for DAI, the demand for selling DAI will be replace by DAI being held by the ecosystem. As a currency, DAI is about as robust as Ether was in 2016. Few use cases, high secondary market supply, little utility. But that is rapidly changing. The greater DeFi grows, the less the peg between DAI / USD will matter. One day, DAI will generate its own independent price feed, from a basket of external reference points, rather than using the Federal Reserves price feeds as a proxy tool. 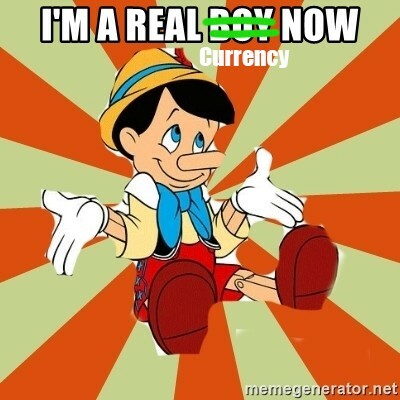 That day, the rubberband will be removed from limiting the potential of DAI, and DAI will have successfully gone through puberty, into its own native stable economy. A comparison of how MakerDAO was able to extract different qualities of Bitcoin, and place them exclusively in one of its two tokens, DAI and MKR. Could MakerDAO trigger a positive feedback loop of increasing ETH price? If (…when) crypto enters a bull market, and Ether price appreciates, CDP holders will have to option to generate more DAI. I claim the most likely thing they are going to do is purchase more Ether, causing a feedback loop. I also have a podcast! We talk about MakerDAO all the time.